Gardner Minshew threw for 470 yards, James Williams ran for three touchdowns, and Washington State beat Eastern Washington 59-24 on Saturday night to avenge a 2016 loss to its FCS neighbor. PULLMAN, Wash. (AP) - Gardner Minshew threw for 470 yards, James Williams ran for three touchdowns, and Washington State beat Eastern Washington 59-24 on Saturday night to avenge a 2016 loss to its FCS neighbor. Tay Martin caught 13 passes for 149 yards for Washington State (3-0), which piled up 565 yards of offense. Gage Gubrud threw three touchdown passes but was intercepted three times for Eastern Washington (2-1), which upset the Cougars 45-42 in Pullman in 2016. Eastern Washington came in leading the FCS with an average of 623 yards per game, but was limited to 372 yards. Minshew completed 45 of 57 passes, two for touchdowns, and was not intercepted. Jalen Thompson intercepted a Gubrud pass to give the Cougars the ball on their own 32. James Williams punched the ball over from the 1 to give Washington State a 7-0 lead. 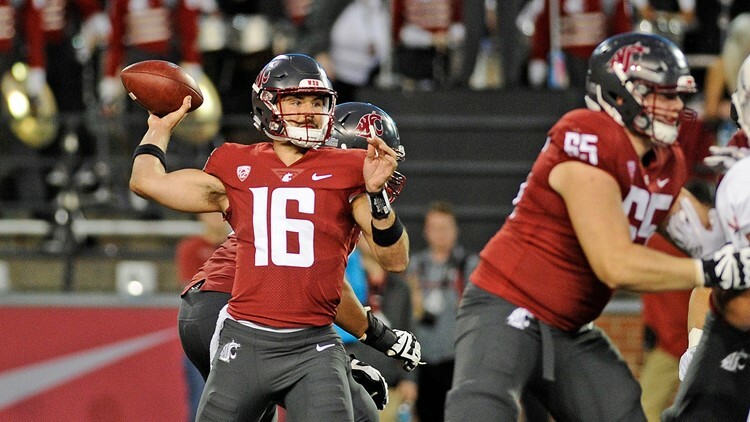 Minshew's 14-yard touchdown pass to Easop Winston Jr. lifted Washington State to a 14-0 lead. Eastern Washington drove to Washington State's 19, but had to settle for Roldan Alcobendas' 37-yard field goal. Travell Harris ran the subsequent kickoff back 100 yards for a touchdown. Gubrud was intercepted near the goal line by Darrien Molton. Washington State drove 98 yards, and Williams plowed over from the 2 for a 28-3 lead. But the Eagles were not going away. Gubrud fired a 26-yard touchdown pass to Andrew Boston to cut Washington State's halftime lead to 28-10. On the opening drive of the second half, Gubrud hit a wide-open Zach Eagle for a 34-yard touchdown pass to cut WSU's lead to 28-17. Minshew completed seven consecutive passes as the Cougars drove from their 1 to the EWU 8. Williams covered that distance for his third touchdown and a 35-17 lead. Gubrud replied with a 44-yard touchdown pass to Dennis Merritt to bring the Eagles within 35-24. Gubrud was intercepted late in the third by Jahad Woods, giving the Cougars possession on Eastern's 27. But they had to settle for Blake Mazza's 44-yard field goal. Minshew hit Martin with a 21-yard touchdown pass for a 45-24 lead with 9:47 left in the game and the Eagles did not threaten again. Eastern Washington: Coming into this game, the Eagles had won three of their past eight games against FBS opponents. They clearly belonged on the field with the Cougars for most of this game. Washington State: Washington State's Air Raid offense gave the Cougars an early lead the Eagles could not overcome. Eastern Washington hosts Cal Poly on Saturday. Washington State faces its toughest test of the season when the Cougars travel to No. 22 Southern California on Friday night to open Pac-12 play.